The new Butler range supports multi-floor operations with the use of an elevator. Robotics and supply chain automation company, GreyOrange, will launch its new goods-to-person Butler XL at LogiMat 2018, the 16th International Trade Fair for Intralogistics Solutions and Process Management in Stuttgart, Germany on 13-15 March. 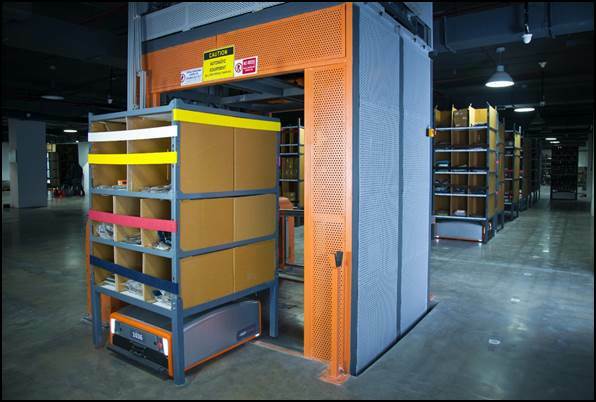 With the new ButlerTM XL, GreyOrange expands the range of goods-to-person solutions that can be used in manufacturing facilities and omnichannel warehouses, to move different kinds of loads from raw materials to finished goods. The Butler XL can handle a payload of 1600 kgs (3500 lbs) including pallets, drums and sacks. Designed to work in tandem with the current Butler system, this makes it easy to add its new capabilities to existing operations. The new Butler robotics system will support multi-floor operations with the integration of an elevator. This provides greater flexibility to optimize handling of inventory across a facility. GreyOrange is a fast-growing company in supply chain automation, deploying its AI-enabled ButlerTM robotics system in warehouses and fulfilment centers for e-commerce, retail and consumer packaged goods. In the last year. GreyOrange has rapidly expanded its presence with its Butler goods-to-person system deployed in Japan, Hong Kong, India and the Americas, plus a new site currently being installed in Europe. GreyMatter is the software platform developed by GreyOrange to revolutionize warehouse operations by connecting people, process and technology more efficiently using Artificial Intelligence. In real-time, it integrates and delivers all of the functionality, intelligence and services required for optimum warehouse operations. At every step of the process, from receiving to storage to picking to fulfillment, orders are consolidated through automation. See the latest high-performance Butler products and solutions on 13-15 March 2018 at Hall 7, Stand F49, LogiMAT 2018, Stuttgart, Germany; register here.Contact GreyOrange at info@greyorange.com or http://www.greyorange.com/logimat-2018.